What would the world be like without electricity, telecommunications, the Internet, combustible engines, septic systems, water and sewage treatment plants, super highways, super markets, etc. We wonder how our ancestors survived without them. Technology has changed everyone’s lifestyles. The church often associated new technology with being the devil’s tool and wanted no part of it. The Amish still hold that standard. Church services still feature hymns written by composers who have been dead for over one hundred and fifty years, an order of worship that is no different than when the Puritans landed on Plymouth Rock, and has maintained the same leadership structure for almost seventeen hundred years. I think it is safe to say that the church does not embrace change as quickly as the secular world does. Some look at this lack of change as stability while some minimally embrace it as an attempt to be relevant with current culture. Those who have embraced wide change are called heretics, and historically they were burned at the stake! The secular world expects change; the church is threatened by it. Why? For a group that believes that “I can do all things in Christ Jesus who strengthens me,”(Philippians 4:14) why are they so threatened by change and fear of the unknown, and fail to adjust? If anyone should understand change, it is my generation, for we demanded it. I was raised in a well ordered church life of going to Sunday School and Church, Mid-week Prayer Service, Choir Rehearsals, and church Youth Activities weekly. 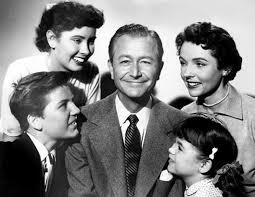 Leave It To Beaver, Father Knows Best, and the Ozzie & Harriet Nelson television shows depicted the sterile, clean, family lifestyle I knew. Then came the rebellious ‘1960’s with Woodstock, hippies, the Civil Rights Movement, the Women’s Liberation Movement, segregation of schools in the South, the Viet Nam War, assassinations of political figures, and even the resignation of a U.S. President under a corruption scandal. America’s moral and ethical infrastructure was challenged at every level, yet the church remained primarily silent, not sure how to address such rapid change. They even resisted the Jesus Movement and Charismatic Movements with in their own ranks during this time. If church change is so cumbersome, what challenges does the 21st Century church face in a connected world shrunk by the Internet? We still have to ask, “Does my local church want to remain status quo, stable, orderly, and predictable, or will it accept the challenges that come with change? What changes are affecting my generation? In the next upcoming blogs we will look at the current winds of change that are blowing over the church steeples of America and the world. The Five Fold Is Already In The Church! In the 1980’s and ‘90’s, my family was active in Lay Witness Missions through the United Methodist Church, a powerful lay ministry composed of pot-luck dinners, small group activities, while staying overnight in local parishioner’s homes. A lay coordinator would be assigned to invite a team of visiting missioners to come share their faith journeys. He would also help establish committees to involve the local parishioners in participating in the weekend. The weekend featured several covered dish dinners, adult small group sessions, Youth activities, and a Children’s Ministry. In Friday night’s small group adult session, only three questions were posed: 1) What do you expect for your church this weekend? 2) What do want for yourself this weekend? and 3) Why did you come tonight? Some came for the food and fellowship. Some confessed they came because their spouses made them. The answers to these three questions were quite insightful. Some wished to get closer to God, to grow in their faith, or to hear how the Lord was working in other’s lives. One wanted to see others get saved while another hoped for more Bible studies, prayer groups, and small groups to be established in the future. 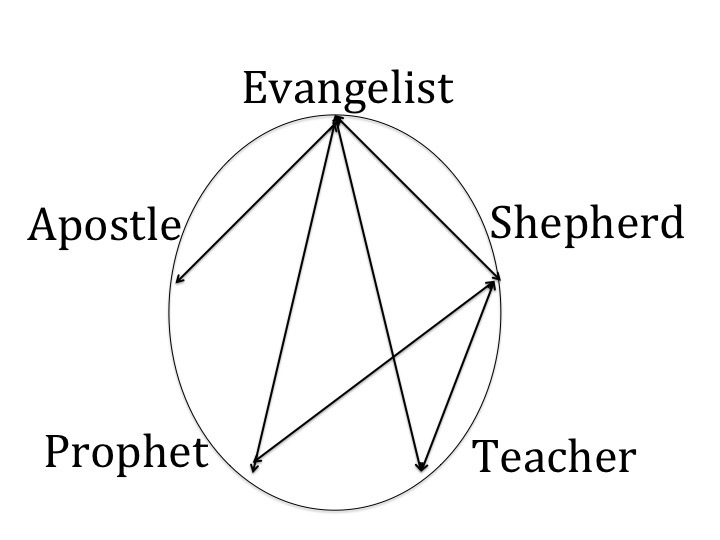 The need for the five fold was prevalent in all these groups: to win the lost, to nurture the saints, to study the Logos Word and transform it into the Rhema Word, to get closer to God, and to see the church as a whole unite and come alive. Even though the weekend had a formal schedule, it still remained fluid. The Lay Witness Coordinator functioned as an apostle: he did not “control” the weekend, but counted on the Holy Spirit to lead it, monitoring the Holy Spirit’s activities through visiting missioners and in local parishioner’s lives. Flexibility was a key to the weekend’s success. My wife and I were part of a 23 member team of Americans to participate in Lay Witness Mission in Johannesburg, Pretoria, and Capetown, South Africa in 1993, while under the watchful eye of local South Africans. They wrote to us what they learned about the experience, “There is safety in following the Holy Spirit.” Wow! They got it! The Holy Spirit was in charge, we are only vessels of service and obedience to His voice. In every Lay Witness Weekend that I have participated, I have met a local believer with an evangelistic zeal. “You must be born again” was understood in every local church. 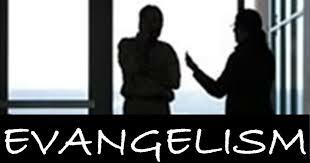 There were believers with pastoral, shepherding hearts who wanted to see spiritual growth among their members. The desire for simplistic biblical truth was prevalent. Yearning for more intimate worship and drawing closer to the Lord was evident individually and corporately. The voices of the five fold were all present. The five fold was already embedded among members in a local church. Believers just needed to be equipped, encouraged, and released in them. As a local church yields to the leading of the Holy Spirit and to the building up of peer relationships in Jesus, the release of the five fold will become more evident. Often the holdback to releasing the five fold through the Priesthood of Believers is the structure. If structure prevents continual revival, then the church must face a metamorphosis, a transitional rebuilding of relationships while being open to new forms or structures. As believers in Jesus, there is a treasure stored deep within us if we are just willing to just dig deeper. If the Holy Spirit “abides with you and in you,” then all we must do is dig deeper within ourselves and release what the Lord has stored in his temple. God has a record of building storehouses, a principle we need to tap into. The foundation for storehousing is founded in Genesis 41, the story of Joseph, whose brothers sold him into slavery, but he rises to power, second only to the pharaoh of Egypt to build storehouses to prevent an upcoming famine. The power of these storehouses brought everyone to be indebted to Egypt, enslaved the children of Israel for the next 500 years, and built an empire! I have heard this passage quoted over and over again to justify financial tithing to local churches to meet their budgets and Christian speakers to finance their organizations. This passage has nothing to do with monetary wealth, but is a significant principle for the Priesthood of Believers who are to ”bring the whole tithe into the storehouse.” We are only God’s stewards. Egypt demanded bringing 1/5th, the church 1/10th, but God demands “the whole tithe,” everything! “’Test Me now in this,’ says the Lord of hosts! I will open for you the windows of heaven and pour out for you a blessing until it overflows.” The storehouses will overflow because everything that is in it, God has put there, not you! He fills His storehouses to overflowing when we give Him our all! Test Him! Can you not see the potential of this storehouse, this temple of the Holy Spirit that is within you and the many giftings it holds: the gift of salvation, the gift of eternal life, the gifts of the spirit, the fruits of the spirit, patience, kindness, meekness, mildness, love, wisdom, word of knowledge, faith, healing, miracles, prophecy, distinguishing spirits, tongues, interpretations, evangelists, shepherds, prophets, apostles, and teachers, etc., etc. “But to each one is given the manifestation of the Spirit for the common good.” (I Corinthians 12:7) There are more gifts than our personal storehouses can contain. Churches today should be ashamed of themselves for not tapping into this valuable resource instead of enabling their laity into passivity and inactivity. The five fold is for the equipping, the building up, and the releasing of the saints for service from their storehouses! Like Williamsport, once rich, then poor, but now alive because of what lies beneath them, the church needs to tap into the storehouses that already lay beneath their laity, the Priesthood of Believers. The best way for me to understand the interaction of the five fold is to be a romanticist and travel back to the days of King Arthur and his round table in Camelot. 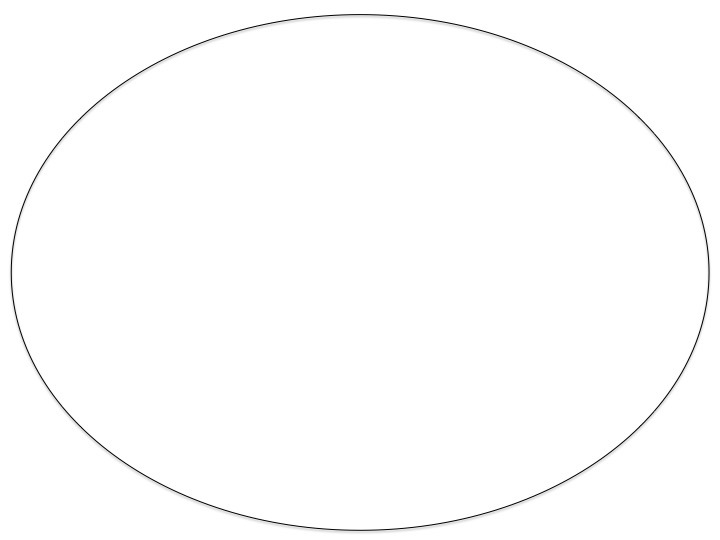 When sitting around the round tables, all the knights were considered as equal, even to Arthur, when united. As long as they were willing to die for one another they remained united and stood strong. As soon as one knight felt strong enough to stand alone and oppose the others, the coalition would crumble into disarray. That is also the picture of the Church historically who claims to be one body but has had a myriad of disapproving knights who have opposed the rest, bringing disarray and division to the Church. If there is such diversity and strong will among its ranks, how is the Church to keep the bond of peace and its commitment toward one another? The Five Fold Round Table: ”For the equipping of the saints for the work of service, to the building up of the body of Christ; until we all attain to the unity of the faith, and of the knowledge of the Son of God, to a mature man, to the measure of the stature which belongs to the fullness of Christ….. from whom the whole body, being fitted and held together by what every joint supplies, according to the proper working of each individual part, causes the growth of the body for the building up of itself in love. (Ephesians 4:12,13,16) The purpose of the five fold is to birth, build, and release a mature man in the image of Christ while uniting the Church. It addresses both individual and the corporate growth of the Church. In the upcoming blogs we will examine how the five can function relationally in practical ways, by supporting, encouraging, and releasing their passions through service to one another while receiving them reciprocally. This is the plan that can effectively draw the five fold into one. How can five distinctly different passions that brought division and sectarianism to the Church for centuries now be the glue to bring unity? That is a valid question. Like most of the gospel, the answer is simple: through relationships! The five fold is about people, believers in Jesus, with different passions for service with different mindsets and points of view who are willing to “accept” one another as equal peers in Jesus by laying down their lives for one another. The five fold is about being in a committed relationship. The twelve disciples were different individuals from different background with different passions, giftings, and personalities who even fought among themselves. During a crucial time of transition between Jesus’ death and resurrection and Pentecost, they did not abandon ship but trusted Jesus’ words to “Not leave Jerusalem, but wait for what the Father had promised, “Which,” He said, “you heard of from Me; for John baptized with water, but you will be baptized with the Holy Spirit not many days from now.” (Acts 1:4-5) They remained together and bonded into a committed relationship, a committed community. Once the Holy Spirit fell on them, they became different individuals with different passions but with the same unifying message: Jesus! To understand the five fold, you must understand the vertical and perpendicular planes of the Cross. The vertical plane is God’s redemptive relationship “with” mankind (John 3:16); the horizontal plane is God’s redemptive plan “between” mankind (I John 3:16). If you do not have a proper relationship with the Godhead and a proper relationship between believing brethren, you have hay, wood, and straw, which will perish. If your relationship with the Godhead and your believing brethren has been redeemed through Jesus, you have streets of gold; you have eternity. 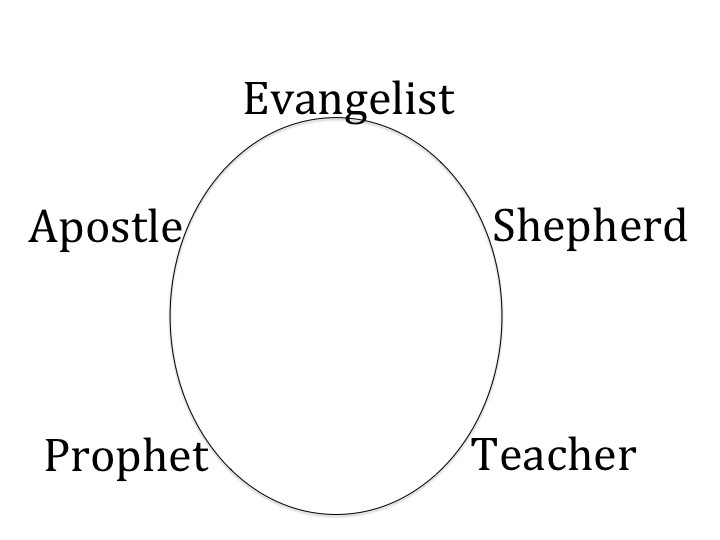 Without these proper relationships, the five fold will not exist because the five fold is about the right passions, drives, and point of views that bring us together, equip us, and matures us in Jesus. Each is an extension of how we see Jesus, what passions we have to serve Jesus, and our mindsets of how we understand and experience Jesus. 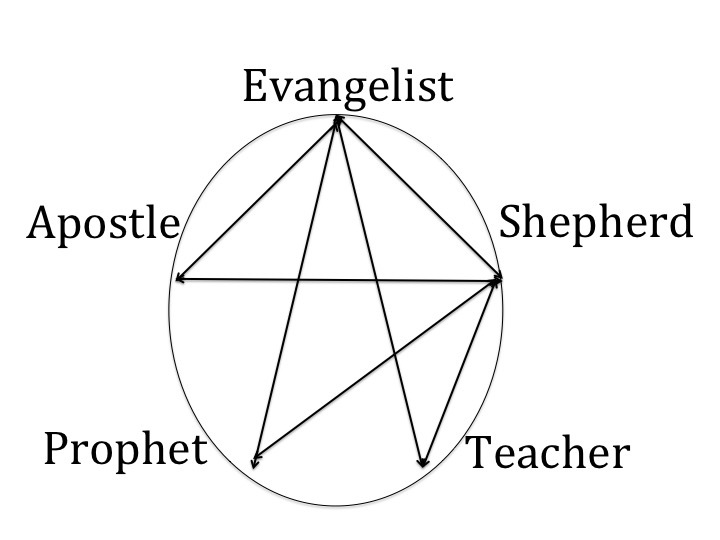 How are believers with five different persuasions to unite in Jesus? By laying down their lives through serving one another, giving to one another, while receiving from one another. Strong relationships are reciprocal. Up to now the five have attempted to stand alone, often competing against one another producing thousands of Christian denominations and sects producing a fragmented Church. To have an united Church, the five will need to bond through “serving” those diverse passions as equal peers in Jesus! The strength of one is probably the weakness of the others, so each needs to support, encourage, and stand side by side so their weaknesses diminish and their strength as a whole produces unity in the Body of Christ, the Church. In the upcoming blogs we will examine how the five fold works in a practical way, releasing each passion in believers to serve, yet be accountable to the other four. Over the centuries, as the Church has been transformed from an organism to an organization, it has become tarnished and wrinkled to the point of almost being unrecognizable between her and the rest of the institutional world. It is time to bring life back into her, transform her back into an organism, washing the stains through His shed blood and power of the Holy Spirit to bring back its whiteness and purity. Because of the heat of persecution and transformation that will iron out the wrinkles, a cocoon stage is warranted. When the Groom, Jesus, returns for his Bride, the Church, she will be alive, beautiful, holy, and blameless! Wow, that’s faith, for it is hard to picture that through my natural eyes, but God sees it through the supernatural! That is Godly vision! 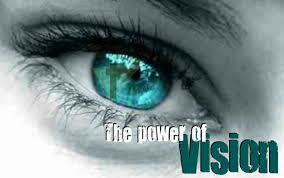 Godly vision for us may come through the five fold. God’s evangelistic vision sees the Bride “reborn” into a new image without “spot or wrinkle” but “holy and blameless.” God’s shepherding vision is “presenting to Himself the church in all her glory” by nurturing and caring for her. Jesus did not leave her as an orphan, but sent the Holy Spirit to her. He then ascended, giving “gifts to men” by forming them into “apostles, prophets, evangelists, pastors and teachers to nurture His Bride. God’s teaching vision gave life back into the Church by making the Logos, written, Word a Rhema, living, Word, so that the church would be an organism again. God’s prophetic vision allows the Church to see itself as He does, a Bride without “spot or wrinkle”. Finally, God’s apostolic vision allows the Church to see the “Big Picture”, God’s Eternal Purpose, the reason and purpose for God to created mankind “in Our image, according to Our likeness”, and God’s desire to restore a fallen man and commune with him. If God can restore a fallen man, He is also capable of restoring a fallen Church! We who have been molded by Western thought may have to view the five fold passion for teaching from a different mindset. We believe teaching to be academic, mental, and intellectual. Educational degrees are essential for advancement up the hierarchal ladder. A pastor of a large congregation is expected to have a Doctor of Divinity degree and be able to orate high quality sermons and extensive theological exegeses. The first century church embraced the Jewish Lamad method of teaching from the heart through experience. David, “a man of God’s own heart,” learned to experience God. The 12 disciples were not Jewish theologians, but only reported “what they had seen and heard” when “hanging out” with Jesus. In America it is important to “know” data about something rather than experience it. Students are tested and evaluated on facts and measurable data rather than on their experiences. As a teacher, I know field trips are far more effective than lecturing. “Experiencing” a lesson gives insights academics can’t, yet the church still teaches mainly through sermons which leaves no room for inquisitive questioning for understanding. It is a proven fact that a well prepared, practiced sermon can be highly entertaining but not very effective in impacting the lives of passive pew sitters. As a public school teacher, I have changed my method of teaching according to the age of my students. You should do one method of teaching for each minute of a person’s age up to eighteen. Kindergarteners last five minutes or less. A senior focuses no longer than eighteen minutes. A good teacher changes approaches, styles, and methods of activity often during a class period to keep interest and productivity. 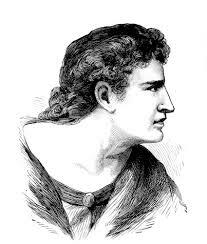 Almost every sermon that I have heard in my fifty years was longer than eighteen minutes. As a pew sitter I have found myself losing concentration, focus, and even fighting sleep. Sermons, as academic exercises, can be “about” forgiveness without anyone “experiencing” forgiveness. Peter learned forgiveness from Jesus after denying Him three times. Jesus allowed him to reaffirm his confession three times asking, “Do you love me?” Peter replied, “Yes, I love you.” Thomas never doubted again after Jesus let him experience touching his wounds and scars. The Samaritan women experienced Jesus as living water and being the messiah. The Lamad method of experiencing, which has been aborted by Western intellects, must also be embraced if we are to understand the five fold as a living organism. The Church is still working on the teaching mindset. What is the passion of the shepherd? 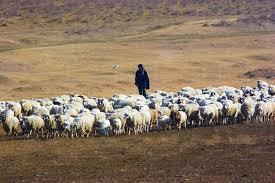 A shepherd is driven to nurture and care for his sheep. He lives, sleeps, and eats with his sheep who intimately knows his voice and become obedient to it. Human newborns are helpless, self-centered, and demanding. Their life is consumed by eating, sleeping, and pooping! “Therefore if anyone is in Christ, he is a new creature; the old things passed away; behold, new things have come. (II Corinthians 5:17)” Everything in Christ is new and unfamiliar. 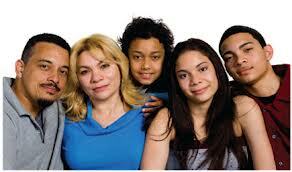 Guidance, nurture, care, and education is needed in this new faith walk called Christianity. Jesus spent three years living, working, and walking with only twelve men to nurture, care, and prepare them for the future. He did not send them to a rabbinical school, a Torah College, or a Jewish seminary. Because He personally nurtured, cared, and taught them, they “experienced” Jesus. Jesus “invested” in them by taking His own personal time to walk and talk with them. The “personal relationship” with Jesus as my Savior and Lord has become known as my “salvation experience” because it came from the evangelistic point of view. A shepherd would emphasize the continuation of this “personal relationship” in order to grow into a mature man in the image of Christ. 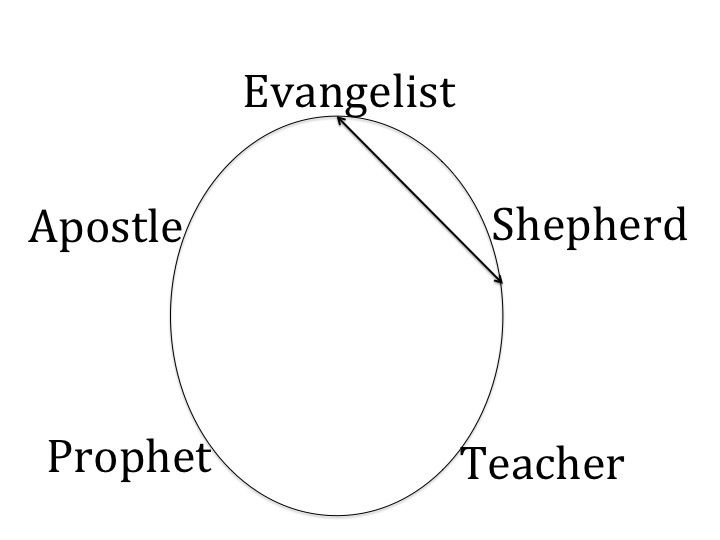 Jesus manifests himself through His Church, so “personal relationships” need to continually be established with an evangelist, shepherd, teacher, prophet, and apostle to maintain spiritual growth. Every Christian needs his peers, the Priesthood of Believers, the Body of Christ around him/her to assure that growth! The five fold is about building relationships to take one from their spiritual birth to being released as a mature man in the image and fullness of Jesus Christ!